Clean the potatoes thoroughly and put them in a pot with enough water so that they are covered by a few inches of water. Add a small handful of salt to the water (the water should taste like the sea). Boil the potatoes until a toothpick or fork can easily be passed through. Drain the potatoes and let them cool. Cut the potatoes into wedges and add them to a mixing bowl. Flake the cooked salmon in with the potatoes. In a separate bowl, stir together the sour cream, lemon zest, scallions, chervil, salt and pepper. 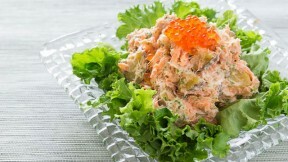 Pour the sour cream mixture over the salmon and potatoes and gently fold the ingredients together. Adjust salt and pepper to taste. Garnish with additional sprigs of chervil or salmon roe and serve in a sandwich or with some crusty bread.